In common with earlier 4 cylinder Porsche air cooled engines, the 6 cylinder boxer engines fitted to the 911 (and later 964 and 993 variants) rely on thin rings fitted into the recess in the cylinder heads between the head and barrel or even just a “face to face” fit at this joint to maintain the integrity of the head gasket seal. All these cylinder heads are particularly prone to the damage and distortion which results from the continuous and extreme heating and cooling cycles that these high performance air cooled engines endure. 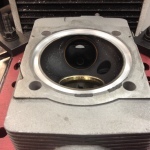 Following any head gasket failure it is good practice to resurface the cylinder head gasket seat to correct any distortion and prevent further problems developing. 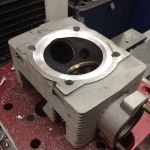 Using a dedicated jig to ensure total accuracy and in conjunction with our BERCO AC650M the head gasket seat is re-faced to an equal depth ensuring that the finished job sits squarely on the cylinder liners while maintaining both alignment of the camshaft carrier assembly and equal compression ratio between all cylinders. 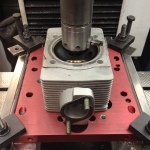 Each cylinder head to be machined is mounted on the dedicated jig which is in turn is fixed to the parallels on the bed of the machine. The cylinder head is centred using the setting stylus and dial gauge which are integral with the boring column before the resurfacing operation is carried out using a cutting tip which has a flat cutting profile. The depth of cut is recorded and equal overall height for all six cylinders is achieved using the depth dial gauge mounted on the machine column. At H T Howard & Co we can carry out any of these cylinder head machining and re-facing operations to give your 911, 964 or 993 engine reliable and long lasting performance. 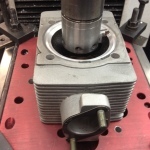 Re-profiling cylinder head to accept big bore piston crowns.